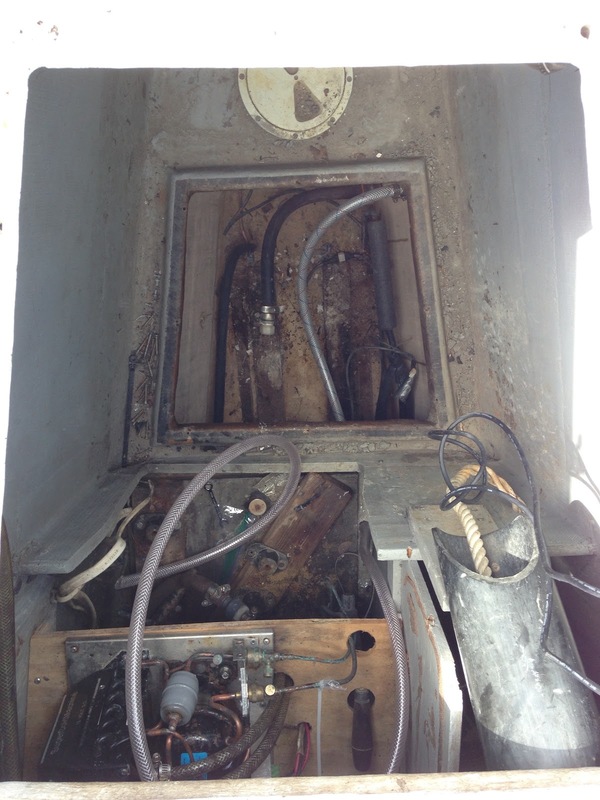 Our rusty a/c compressor--outta here! On our survey, the a/c didn't work (dang). Then, miraculously, it did work (Yeah!). Then it quit again (Dang!). As you may recall, we gave in and bought a window a/c unit from Lowe's in Charleston. 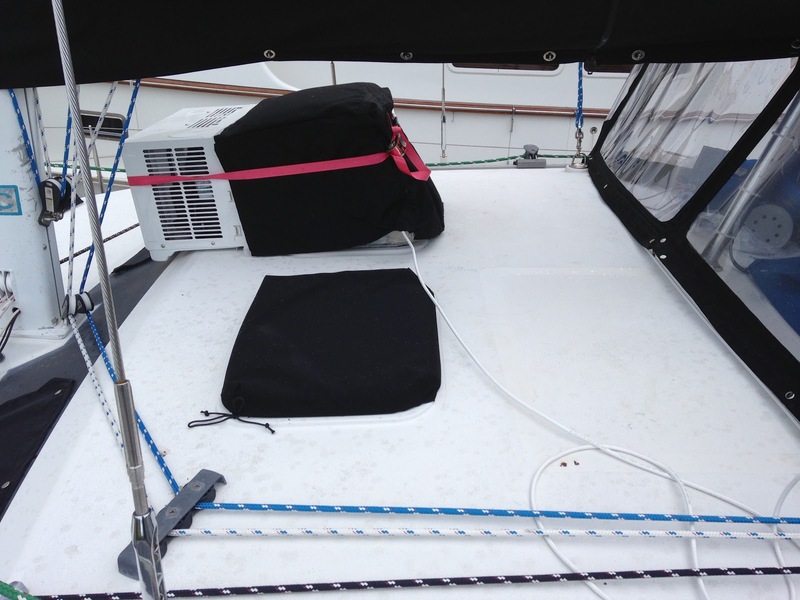 Since then, it has been improved with insulation, a canvas cover and modified ducting (new piece of cardboard). 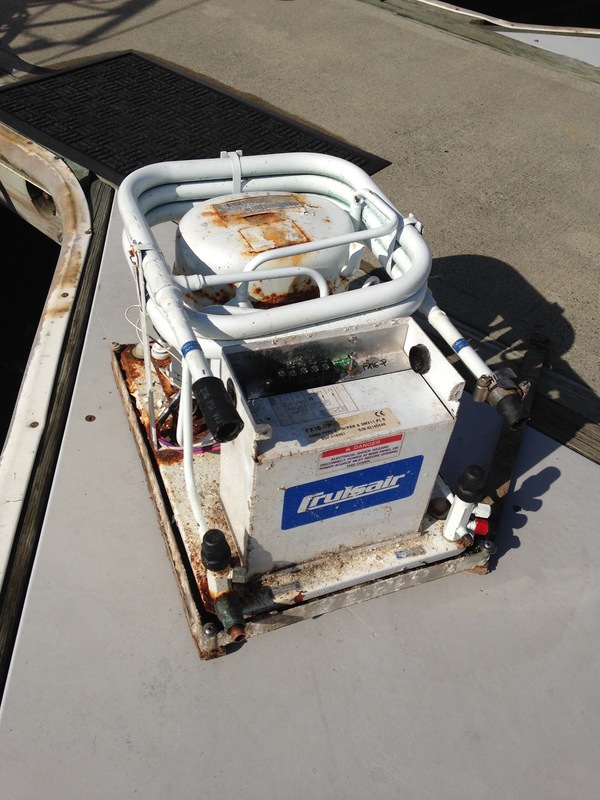 It will also run off our portable generator, if needed (the boat's a/c wouldn't). So when our dock neighbor's a/c went out, so we didn't hesitate to give them our a/c water pump. 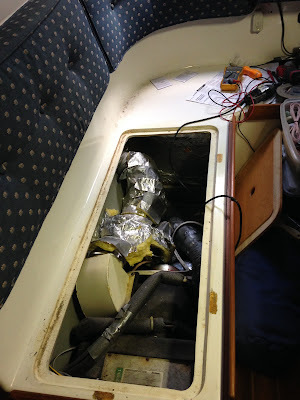 We've discussed removing the boat installed a/c unit since the window unit seems to work fine. (If it quits working we chuck it & buy another one for $100. 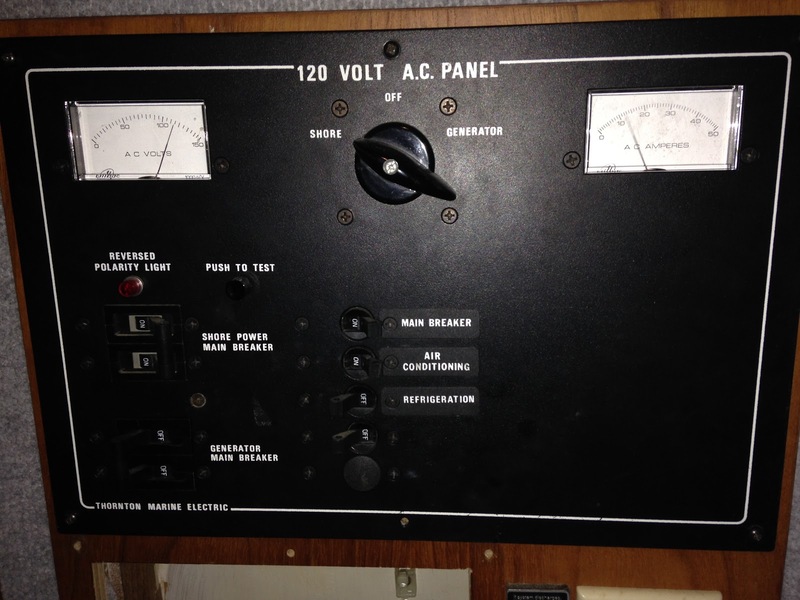 Our boat a/c controller would need to be shipped into the manufacturer, who will probably tell us we need a new one.) 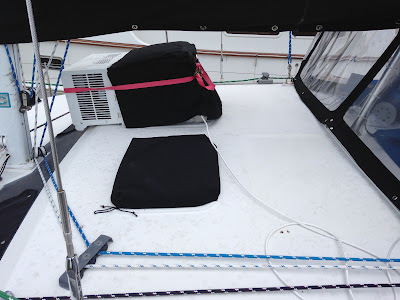 There was talk of putting a water-maker in it's place (under the settee) or at least making room to store the portable a/c unit when underway. SO one lazy morning, the Captain got to work. The compressor was in the primary anchor locker (port bow). When he attempted to loosen the attachment bolts, he was surprised to find it was no longer attached to anything! Apparently, the wooden base had disintegrated (this immediately brings some 3-4 ft/5 sec interval, bow pounding on the Chesapeake Bay to mind). 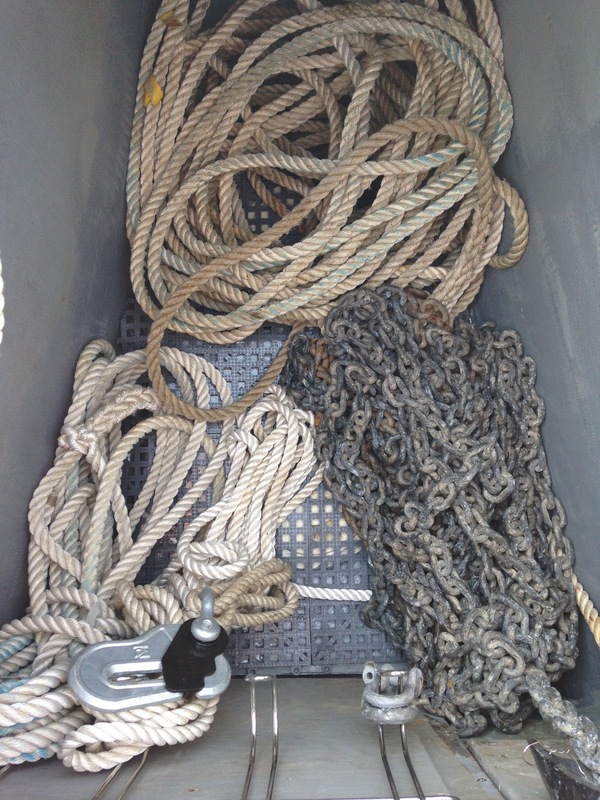 Another bonus will be 50 lbs less weight in the bow (more chain for the anchor! Whoo hoo!) He was also disappointed to see the "marine quality" condenser was rusted through. 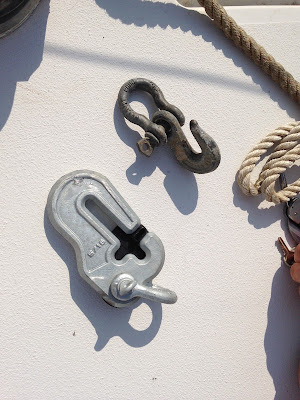 ("How can they charge extra for marine quality when it's rusted through? You might as well buy it at Home Depot.") While there, The Captain also rerouted the water line that cools the fridge condenser coils to the a/c's previous drain hole, since it's above the waterline (so we can monitor flow). 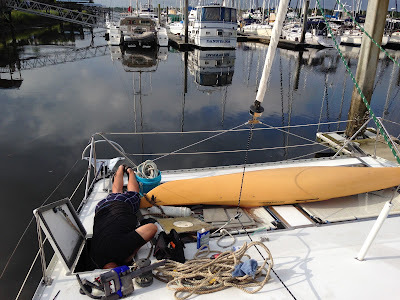 Wiring was rerouted from the forward hull and aft storage compartment (a/c circuit breaker) for a new GFCI electrical plug installed in the settee for window a/c unit. It runs to a separate breaker, in case the shore power goes off line (previously, the window a/c unit continued to run and could ruin our beautiful, new batteries). In the middle of all this, the propane quit working. Good times. Painting the locker. I'm told sweating onto the fresh paint made this task more difficult. Looks like Amelia uses that new pellet litter from Purina Tidy Cat. We switched just before this trip and it has eliminated all the fine dust and the small bits of litter that get distributed around the boat. Clyde is not crazy about how it feels on his paws and I don't blame him. It would be like trading walking barefoot on a sandy beach for walking on large pebbles. 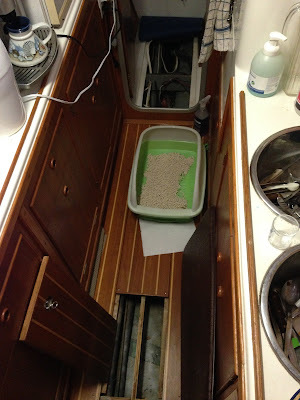 Yes, I'm grateful not to have litter all over the boat. She hated all those "litter tracking" mats. She'd jump over them and spray litter everywhere! 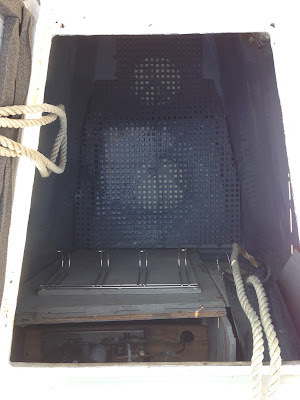 Regarding painting the locker with sweat dripping into the fresh paint: Seems like the least the first mate would do is provide a cooling fan for the captain while he is hard at work!! It seems that your window AC unit has been served you well. It was really a smart purchase, considering how erratic your on-board one was. 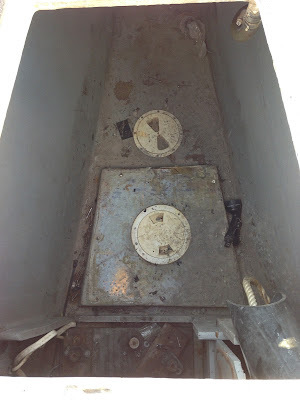 At the very least, you’re not forced to have the old AC repaired, and you can free up a bit of space. Whether you remove it or not, we hope it's for the best, and in such a way that you would be spared from more spending and inconvenience. Good day!